Airaid 401-799 - Airaid Jr. Kits - FREE SHIPPING! 2012 f150, 5.0 coyote eng., cold air intake. 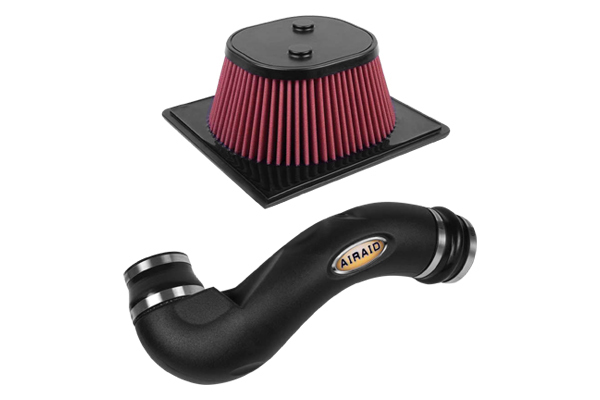 very happy with my airaid jr. intake. good quality. easy install. good value for the money. the f150 already has a good air box and inlet. all that was needed to make it better is a tube without the resonator chambers and a good high flow dry filter. this fit the bill perfectly. Very, easy install. It literally takes about 15 minutes to complete. Fairly thick composite tube which should be good for heat resistance. The tube is a much larger diameter than the stock tube and looks great. This perfect for the guy or gal that really understands that all you really need to do is switch out the tube, not the air box. 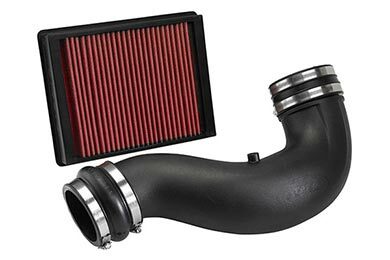 On this year Ford the air box has a pretty large diameter inlet so in my opinion why change it. For colder air put foil back pipe tape on bottom of the tube. Great performance for the money. Gave my truck better throttle response and more pep. I liked that I saved money by reusing the stock air box . Let me start off my saying this is a really nice piece and it moves a lot of air but for how I use my truck it's kind of a waste. I imagine that this intake and full exhaust, headers and all,you could see significant power gains. It just seems to me that I lost a little throttle response after I installed the intake tube and am half tempted to reinstall the stock intake tube.i saw the biggest gains running just the cone filter that comes with the kit, believe it or not. Upwards of 22 mpg's. Quality of the filter and intake itself is unmatched. The improved airflow as allowed the engine to breathe like it should and as a result, it now sounds like a V8 should! Autoanything prices can't be beat! Reference # 753-688-505 © 2000-2019 AutoAnything, Inc.